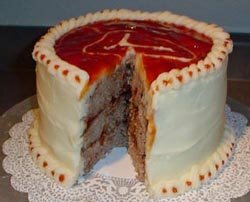 I haven't written here in a very long time, but recently I noticed how many fine folks stop by looking for answers about glorious meatloaf. I am going to take the time to update more often, but I'd like to hear from everyone who stops by. 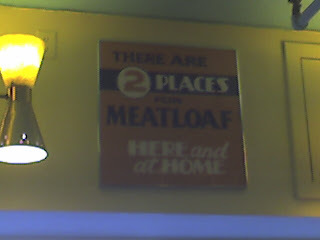 Just to get you started, here is a photo I took with a bad camera in early 2007 at Zak's Diner in Ottawa, Canada. Back around Jan. 7th, JOR! posted his mom's meatloaf recipe. Since Sami Lama requested it, here it is reposted for everyone's enjoyment and edification. 1. Make 6 small loaves (must be round, not square) - cover with sauce, on top only, of course. 2. Bake 350 degrees for 35 minutes. Pretty simple and straight forward and oh so delicious. These meat pucks, and I mean that in the most flattering of ways, are 'old-school exceptional' on my meatloaf scale. So, dear 'loaflings, I have been silent for too long. Yes, it is an excuse you have all heard before and I don't know what to say. 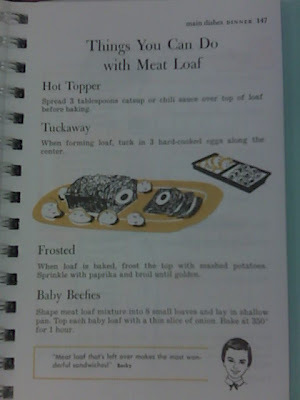 I seem to have fallen into a long winter of meatloaf hibernation. My juices aren't flowing and I haven't baked a loaf in quite some time. 1) A month or so ago, at one of the many irregular meetings of VGC, Jor! (yes, the exclamation is warranted) served his mother's homestyle recipe. And what a tastey treat, well worth the trip to Stayner or just over to Jor! 's for a bite. Hopefully, I will post the recipe here soon. 2) I have recently become addicted to Gordon Ramsay's Kitchen Nightmares. If you haven't seen this show you don't know what you are missing. Watching Gordon Ramsay, one of England's better chefs, go into nightmarish professional kitchens and basically swear at everyone until they cook better is brilliant TV. "How does this relate to meatloaf? ", you say. Well, check out episode 3 of season 2, Momma Cherri's Soul Food Shack for Gordon making, what I can only imagine, are the world's tastiest meatloaf tapas. 3) Stumbling through the interweb, you often come across the craziest of things. People with time and energy can accomplish anything. Like this woman, Sonya Thomas. She is ranked second in the world by The International Federation of Competitive Eating. In 2004, she ate 8.4 lbs of baked beans in 2 minutes and 47 seconds and she is only 105 lbs soaking wet. According to the IFOCE, she is the great American hope in toppling the dominance of the Japanese in the annals of competitive eating lore. One can only hope they add meatloaf to the list.